A couple years ago, I was at my parents' house in PA when I saw my mom tip toeing across the living room with a piece of duct tape. Turns out it was her solution to removing stink bugs. They were popping up all over their house. Stink bugs are exactly what you think they are. If you squish them, they put off a strong, foul smell. Even if you startle or scare them they emit the odor... making it tough to just toss them outside without geting the stink. There are warnings against vacuuming them up because then you can't get the scent out of your vaccum. Hence the duct tape method. 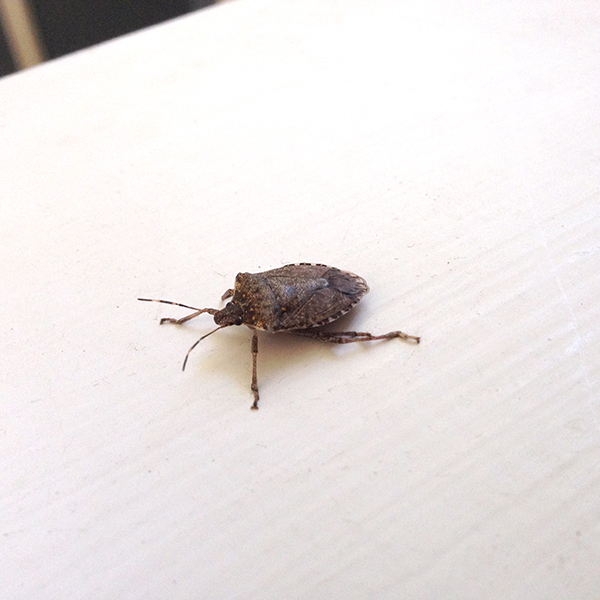 Stink bugs are not native to the US. They used to only be in China, Japan, Korea and Taiwan. They were "accidentally" introduced to the US. Whoops... dropped a stink bug! They were first found in Allentown, PA in 1998. This year I have started to see them in our house and I'm seeing friends on Facebook in the same situation. I guess they have finally migrated north. Stink bugs don't bite or sting but they are a threat to farm crops. And once they get in your house they are a nuciance. I saw Wyatt chasing one and I thought, if he chomps on it, that will be the first and last time. Note to self - pick up some duct tape at the store. Ugh - they are the worst! Not sure if this is better or worse than duct tape, but they die immediately when submerged in dish soap. I keep a small mason jar around with a mix of dish soap and water, and when I see a stink bug I flick it inside. If you're fast they don't emit the smell, and if they do it's mostly contained in the jar. And if I use lemon scented dish soap that will help mask it! Thanks! They're docile and curious enough if you hold out a piece of toilet paper, they'll grab on. Then they get flushed. Or if I'm feeling generous I'll put them back outside. But mostly they get flushed. We had two really bad stinkbug years here in Virginia. Haven't seen too many this year so I guess you're right, they're headed north. I had been handpicking them and dropping them in diluted PineSol. It's the only thing that sort of covers the smell. The duct tape idea intrigues...what do you do once they are stuck? I would think they'd still stink when they find out they are trapped so just dropping them in the trash wouldn't really work? Well see... if you use the duct tape... you seal it all around and the stink can't get out. It's kind of mean, but hey... no one invited Stinky into your house.